Treatment of heel pain using the latest techniques by San Antonio Podiatrist, Dr. Ed Davis. Why does my heel continue to hurt despite treatment? Dr. Davis is a podiatrist in San Antonio with over 25 years of experience treating foot and ankle pain. He is a graduate of the Temple University School of Podiatric Medicine and performed a residency in Podiatric Surgery at the Veterans Administration Medical Center in Washington, DC. He is Board Certified in Foot Surgery by the American Board of Podiatric Surgery and is a Fellow of the American College of Foot and Ankle Surgeons. Dr. Davis was an early pioneer in the use of ESWT or extracorporeal shockwave therapy for intractable plantar fasciitis and brings over 10 years of experience in that field. Dr. Ed Davis is a board certified podiatrist in San Antonio, Texas with a special interest in the diagnosis and treatment of heel pain. Heel pain is one of the most common concerns that bring patients to the foot specialists' office. It can significantly affect the ability to work and limit physical activity. Many people are trying to exercise more for fitness, weight control, improvement of cholesterol levels and general health but are limited by foot pain. Plantar fasciitis is often the cause of heel pain seen by podiatrists although many other causes exist. A thorough exam is important to achieve an accurate diagnosis and targeted treatment. 1) Plantar fasciitis: The most common cause of heel pain; an inflammatory condition of the plantar fascia, the ligament responsible for supporting the foot. 2) Calcaneal apophysitis: Pain and inflammation of the growth plate present in the heel bone in adolescents. 3) Calcaneal spur: This generally refers to an area of calcification found in the plantar fascia and is rarely a cause of heel pain. A "spur" may also be found, at times, at the area in which the Achilles tendon attached to the back of the heel. 4) Nerve entrapment: various nerves found in the foot can become damaged or compressed causing heel pain. a) Tarsal tunnel syndrome: The major nerve to the bottom of the foot passes through a tunnel at the inside of the ankle. 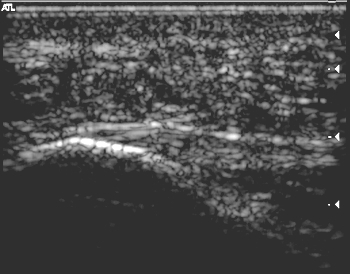 Entrapment of the posterior tibial nerve can cause pain on the entire plantar (bottom) surface of the foot and may not be related to physical activity. b) Medial calcaneal nerve entrapment: Nerve on the inside of the heel causing burning pain on the inside of the heel. c) Baxter's nerve entrapment (inferior calcaneal nerve): Probably the most common nerve entrapment confused with plantar fasciitis as the inferior calcaneal nerve runs along the bottom of the heel near the origin of the plantar fascia. d) Medial plantar nerve entrapment: The branch of the posterior tibial nerve that runs along the inside of the bottom of the foot, may cause shooting pains and numbness to the bottom of the big toe. e) Lateral plantar nerve entrapment: The branch of the posterior tibial nerve that runs along the outside of the bottom of the foot. 5) Achilles tendinitis: Inflammation of the tendon that attaches to the back of the heel bone. 6) Plantar fasciosis: Fasciosis refers to a degenerative process of the plantar fascia. Once termed "intractable plantar fasciitis" as it does not respond to treatments for plantar fasciitis. This is not mean to be an all inclusive list as there are other causes of heel pain. Plantar fasciitis is the most common cause but, if persistent or if not responding to treatment, a more thorough workup is needed. Plantar fasciitis can often be diagnosed by patient history and exam alone. Nevertheless imaging plays an important role in refining the diagnosis and determining the best treatment options. The plantar fascia is a ligament and, like all soft tissue, it cannot be visualized on x-ray. 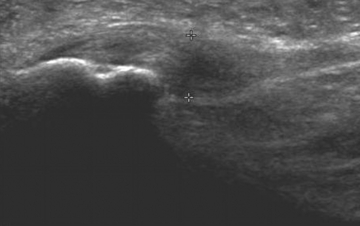 Dr. Davis utilizes in office diagnostic ultrasound to examine the plantar fascia. The term, plantar fasciosis, refers to what used to be termed "intractable plantar fasciitis." Plantar fasciitis, when persistant, can lead to thickening, degeneration and scarring within the ligament. Plantar fasciosis has been somewhat more challenging to treat but that has changed with treatment specific for that pathology to include the Topaz procedure, http://www.topazprocedure.com, and ESWT or extracorporeal shockwave therapy. ESWT uses acoustic waves to induce remodeling or rebuilding of the diseased tissue, that is, replacement of the diseased tissue with healthy tissue. ESWT was discovered by accident in the late 1980's. ESWL or renal lithotripsy involves the use of acoustic waves or shockwaves to break up kidney stones. Researchers noted that the healthiest tissue in the kidneys occurred after application of such shockwaves. Study of the effect of shockwaves on tendon, ligaments and bone followed, leading to the birth of a new industry. It was noted, by the researchers, that diseased tendons and ligaments were induced to regenerate new tissue, often eliminating the need for surgical treatment. A good place to read about the technology is on the website of the ISMST or International Society for Musculoskeletal Shockwave Therapy, http://www.ismst.com/. ESWT was first approved by the FDA for use in plantar fasciitis in the early 1990's and then lateral epicondylitis (tennis elbow). Early ESWT machines introduced into the US were large and basically miniaturized ESWL machines. That technology was expensive and the treatment performed in surgicenters, requiring anesthesia. New techniques provide hope for patients with tough cases of heel pain. Extracorporeal shockwave therapy, laser , the Topaz procedure and platelet rich plasma are among the advanced techniques utilized by Dr. Davis, a San Antonio podiatrist. PRLog (Press Release) – Apr 10, 2011 – Heel pain is one of the more common concerns that bring patients to the podiatrist's office. Podiatric medicine and surgery. Over 25 years of experience successfully treating foot and ankle problems. Click on the above link for Dr. Davis' blog on heel pain. 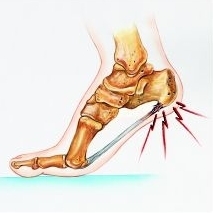 Latest treatments for heel pain including ESWT, the Topaz Procedure and MLT.